Mae’r model yn cynrychioli rhan o orsaf ar gangen i reilffordd y Brecon and Merthyr a redai o Gasnewydd i Aberhonddu gyda changhenni i Rymni, Dowlais a Merthyr Tudful. Daeth y B&M yn rhan o grŵp y Great Western ym 1922 pan gasglwyd y rhan fwyaf o’r hen gwmnïoedd rheilffordd annibynnol i mewn i bedwar cwmni mawr. Afraid dweud bod Llanastr yn llecyn dychmygol ond tybiaf fod y dref yn ardal y min gogleddol y maes glo'r de yng ngogledd-orllewin yr hen Sir Fynwy. Mae’r cyfnod yn aeaf yn y blynyddoedd cyn y rhyfel byd cyntaf pan oedd y diwydiant glo ar ei anterth ac mae trenau cyson o lo ar y lein yn ogystal â threnau i deithwyr i Bengam a Chasnewydd a nwyddau cyffredinol. Mae’r modelau ar raddfa o 4mm i bob troedfedd ac mae’r pellter rhwng y cledrau yn 18.83 mm. Mae adeiladu’r cledrau yn waith law ac mae dros 90 o gydrannau ym mhob pedair modfedd o gledrau. Seiliwyd yr adeiladau i gyd ar enghreifftiau gwreiddion a safai ym Machen, Rhymni a Rhiwderyn. 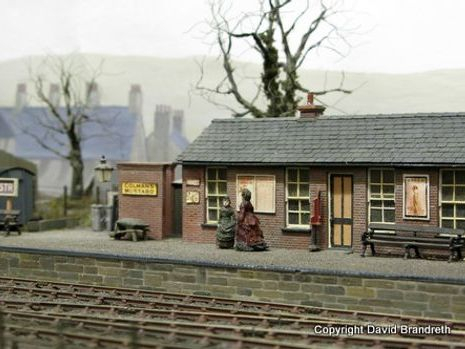 The idea of Llanastr was born in the early eigties when I was exiled form my native Wales and found myself in a flat too small to accommodate the layout I had been building based on the Brecon and Merthyr station at Rhymney. In order to ‘keep my hand in ‘ and to allow me to run my stock I decided to build a particularly compact layout that could be erected and dismantled in a short space of time. The layout was featured in two early editions of the Model Railway Journal (No 2 and 4) and was exhibited widely between 1985 and the early ‘nineties. In 2009 it was dragged out of retirement to be shown at Scaleforum and has attended a few exhibitions since (see Exhibitions). The baseboard design is conventional with a plywood surface and 5” deep framing. No allowance was made for intermediate support and some sagging has occurred. For exhibition the layout is mounted on a simple frame of 2”x1” timber. The frame also supports a fascia intended to give impression of the blue enamel station nameboards that the B&M used. The lighting, two fluorescent tubes, is supported by the fascia. The baseboard top is around 4’ (1200mm) high, having being raised from the original 3’6” (1050mm) as I found that being closer to eye-level gave a more realistic viewing angle. One drawback is that it makes it difficult for smaller children to view at exhibitions but normally there are other layouts around more attractive to the younger eyes; another is the increased tendency for the viewer to look across and therefore potentially beyond the layout – so jump twenty years and to the backscene section. One of the prime objects throughout the planning of the layout so far has to avoid the cramped look that can sometimes occur with small layouts (and many larger ones). In designing the track plan it became apparent to me that much of the length of the typical terminus station is taken up in the run-round loop, so in order to reduce the layout length I decided to place the scenic break in the middle of the station and use the fiddle yard sector plate to complete the run-around and facilitate shunting. The resultant design includes platform and runround capable of handling passenger trails comprising three six-wheel coaches and a four-wheel PBV and an 0-6-0 or 2-4-0 tender engine (though the B & M was a tank engine only line after the 1880s) and two sidings; one with access to a bay platform and the other to the goods shed. Both turnouts are B6 and the minimum radius is 4 feet. 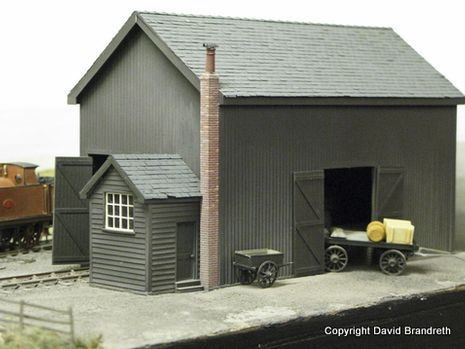 The overall dimensions including fiddle yard are six feet long by fifteen inches wide. The main baseboard itself (excluding support frame, lighting, etc.) is split in the middle and hinged to form a unit which measures 3’ x 2’6” which is easily carried in one hand and was designed to fit into the boot of the Vauxhall Chevette saloon I had at the time. The trackwork is built to a nominal gauge of 18.83 mm. The materials used are those normally employed for Scalefour at the time i.e. plywood sleepers, brass rivets, nickel silver rail and cosmetic chairs in whitemetal. In designing and building the track I have endeavoured (and in several places failed) to model the B & M permanent way rather than slavishly follow ‘standard’ drawings. 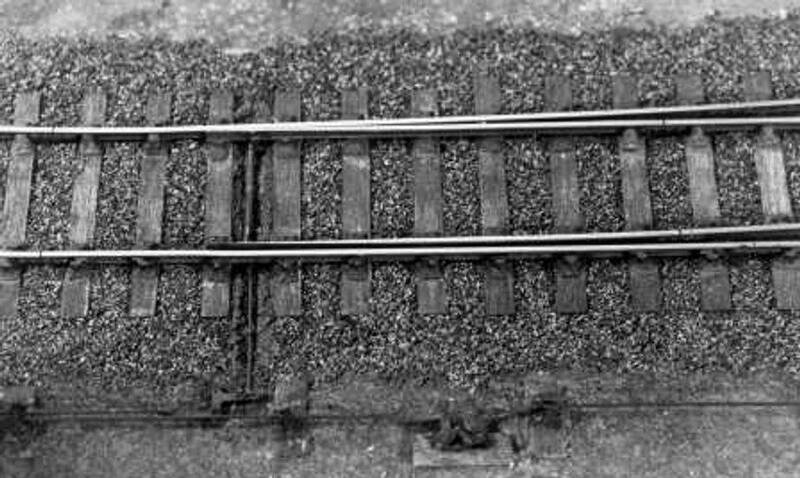 When looking at a photograph of a B & M station one of the most striking differences between pre- and post grouping could be seen in the quality of the track work (although it galls me that I have to admit that the GWR improved matters so markedly in the Permanent Way department). Thus points are modelled with ‘straight cut’ blades and four bolt chairs are used throughout. The latter goal was achieved only by devious means. The Scalefour Society at the time had three types of chair available: two bolt chairs, three bolt chairs in the style of the LMS et al with two bolts on the inside and one outside, and three bolt chairs in the style of the LSWR with the two bolts on the outside. Four bolt chairs were not to be had so I purchased the two types of three bolt chairs in equal quantities and set aside the halves of each chair that had one bolt on them leaving me with an inside half chair with two bolts and an outside half-chair with two bolts - giving me my requisite four bolt chair. The remaining parts were used as two-bolt chairs on a GWR layout that the former Scalefour Society North Bucks Group was building at the time. A rather cruel blow-up of one of the turnouts and rodding. For the most part the B & M used ash ballast that was finer than that used elsewhere or on more modern railways. To represent this I used steelworks slag that I had sieved through a series of graduated sieves to give particles within a scale size range of ¾” to 1½”. A finer cut of the same material is used on the platform surface. Points are operated by mechanical means using wire-in-tube and cranks to transmit the motion through the baseboard for the final (and visible) part uses Colin Waite’s excellent (and lamented) etched brass point cranks to operate the tie bar and also some of the point rodding with the intention of creating the illusion that the point rodding is moving the tie bar. Hopefully this sketch explains things better than my cumbersome words. As originally conceived the electrics of the system are brutally simple and conventional. The main part of the layout is constantly live, though the wiring design was such that the layout could be divided into three independent sections if required. A rotary switch selected which of the sector plate roads would be live. Loco control was generally via an AMR handheld unit connected via a DIN 5 pin plug. In the time that Llanastr was ‘resting’ the world has moved on and DCC has started to make its presence felt on the scene. My initial thought was that DCC offered no benefits on such a small layout and it’s certainly true that Llanastr cannot take full advantage of all the functions that are available with DCC. However I found that when I rejoined Newport MRS, who were firmly committed to DCC, I realised that to operate my (B&M) locos on the club layout or test locos that I might build for the club layout Little Mill Junction I’d need to go DCC. All the locos have been fitted with decoders and it has proved to be a relatively painless; even on the diminutive Lady Cornelia I was able to fit CT Elektronik DCX75D decoder between the frames. My preferred manufacturers are Zimo and CT Elektronik, but I have a few instances of Lenz as well. The only loco which has presented any problems in conversion is a GWR 517 class 2-4-0T which has an open framed motor (Anchorage, possibly a D13) that is live to the chassis – a definite no-no in DCC and poor practice anyway IMHO. I shall have to find a way of insulating the live side of the motor or fit a new motor. The layout itself: I merely swapped the input from the AMR controller to that from an NCE Power Cab and away to go – literally a two-minute conversion. At the same time I elected to by-pass the rotary switch mentioned above to enable me to make the fiddle yard continually live when operating on DCC. One signal adorns the layout, a McKenzie and Holland somersault of the type extensively used by the B & M in its latter years. The model was built using etched components from D & S (intended for the GNR but suitable for the B & M with a little attention) and castings from Sprat and Winkle. 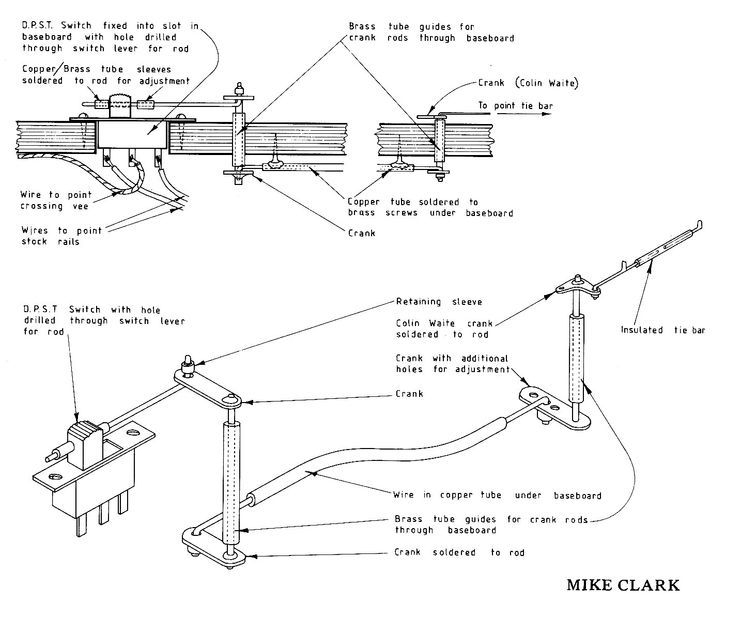 The arm is operated mechanically using wire-in-tube from a lever under the road bridge. The scenic side is not exceptional, the few contours which exist were provided by expanded polystyrene. This was covered by Carr’s earth mix, which was teased up several hours after application, followed by a form of zip texturing. This I believe was originally described in a Model Railroader of many years ago. It entails mixing powder paints with plaster, putting the mixture in a fine meshed tea strainer and tapping its side several inches above the layout surface. Water is then sprayed into the air from below baseboard level to allow it to fall onto the required area. It can be a messy business but quite large areas can be covered quickly (though speed was of little importance on a layout the size of Llanastr). I have developed a liking for the washed-out shades of vegetation in mid winter and have made an attempt to depict them in the colouring of the layout’s flora. One of the advantages arising from this decision is that trees can be modelled without foliage. For the two trees on the layout my thanks go to a fellow member of the local Scalefour Group, Mike Clark who produced a couple of bare oaks especially for the layout. Brambles, ferns, long grass etc have been represented by a nylon scouring pad, selected lichens, Woodland Scenics, etched brass (Scalelink ferns), plumbers hemp, surgical lint and various fibrous materials of dubious origin in various combinations, suitably dyed or airbrushed as seemed appropriate. A single gorse bush adorns the bank behind the station, this was cobbled together from picture hanging wire, the inevitable scouring pad and Woodland Scenics. Hopefully others will follow as time permits. Whilst on the subject of colour I have endeavoured to maintain subdued shades throughout the layout, and have not used unadulterated black or white anywhere. Whilst on first sight this produces a rather dull effect, I feel that less intense hues give a more natural look to the model. There are four types of fencing on the layout. The longest length is of wooden post-and-rail fencing and is based on a drawing discovered in the (then) P.R.O. at Kew. Not wishing to spend weeks singeing my fingers in fabricating the fence from brass strip and fearing that polystyrene would be too fragile, I decided that photo-etching was the answer. I drew the necessary artwork, passed it to Andrew Wiles and a few weeks later the finished brasswork appeared. For the wooden fencing at the rear of the station I used to oft-maligned Ratio fencing, but by replacing the posts and filing a sharp point on the top of the vertical pales a reasonably satisfactory result can be obtained. The other pieces of fencing are short lengths of rail and wire and Scalelink spear fencing. The railway buildings are all based on B & M prototypes. 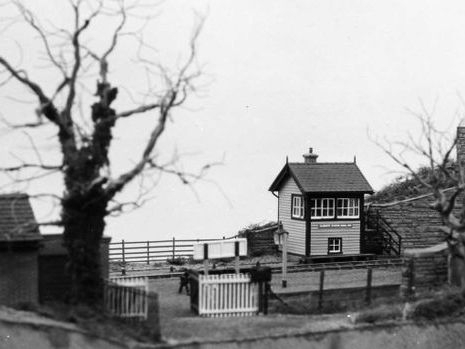 The station building and Goods Shed are taken from Rhymney; the Signal Box from Rhiwderin and was described in issue No. 2 of the Model Railway Journal and the over bridge from Machen. The only non-railway building the end of an end of terrace cottage is based upon a building standing not too far from Machen Station. Actually this is a mirror image to suit its position on the model. All the buildings are made from polystyrene in one form or another using similar methods to those described in the article MRJ2. The overbridge was made mainly using Wills coarse stone with which I am very satisfied, though some effort must be taken to ensure a good join between sheets. The arch-and capping- stones were formed from individual polystyrene pieces roughed up with blunt knives and dental burrs. There were many examples of the type of water column modelled (see below), instances being found at Torpantau and Tal-y-bont. This is one of the few items on the layout that post-date the MRJ article. The painted backscene was an addition for Scaleforum in 2009. I had long thought that some sort of break at the rear of the layout to give the viewer a separation between the modelled layout and the rest of the world would be advantageous. With Llanastr being mounted fairly high it is easy for viewer’s field of vision to include too many distractions (operators’ beer guts, etc.) Luckily for me, Mike Clark, of Masokits fame, thought the same and volunteered to paint a backscene for me. Knowing Mike’s sense and appreciation of colour I immediately accepted. To provide the background information I hied myself to Rhymney and Pontlottyn, the area where Llanastr was supposedly based, during the winter of 2009 and took a series of photographs of typical buildings and the general landscape. I sent these off to Mike with the profile of the rear and end of the layout marked with the locations of architectural features. A few weeks later a large drawing paper roll box appeared in the post containing Mike’s backscene. Mike had done a superb job using muted colours and deliberately avoiding eye-catching detail. My next job was the hardest; I was tempted to get it framed but I had to take a scalpel to it to allow it to fit the features of the layout and provide access to the point switches and signal lever. Despite the fact that the backsene was made away from the layout it all fitted very well and it has had a very favourable reception at Scaleforum and subsequent exhibitions. Now why didn’t I add a backscene a quarter of a century ago? An upshot of the backscene is that the operator’s view of the layout is impaired making operation from the front a more attractive proposition. The danger with anything as small as Llanastr is of course, that a single operaor can almost eclipse the layout. Nevertheless I have added push-button switches for the coupling electromagnets to the front and the hand-held controller can also be accessed from the front. I could arrange for the points and signal to be controlled from the front too, but as it would take substantial reworking to move the operating position for the fiddle yard from the back I haven’t taken this further. The corollary of this is that operation from the front is only really practicable when we have two operators. After a twelve or so year hiatus Llanastr returned to the exhibition circuit at Scaleforum 2009 and has since been seen at Scalefour South West 2010 at Wells, Cardiff 2010 and the Welsh Railways Research Circle (WRRC/CYRhC) AGM 2011, the Bristol Model Railway Exhibition , Railex in Stoke Mandeville, both in May 2012, Scaleforum again in 2014. In 2016 it was shown at the Scalefour AGM. The next show planned is expoEM Spring 2019 in Bracknell. The Rhymney layout that I alluded to in the introduction remains in the attic; I did start work on it again in the eighties, widening the baseboards, but having looked at it again in 2011, although the 1970’s ply sleeper, rivet and whitemetal chair trackwork still looks pretty good today, I doubt if I want to go back to a layout of that vintage.